FreeBSD with the same ISC workload. * FreeBSD 7.0-R with 4BSD scheduler has close to ideal scaling on this test. 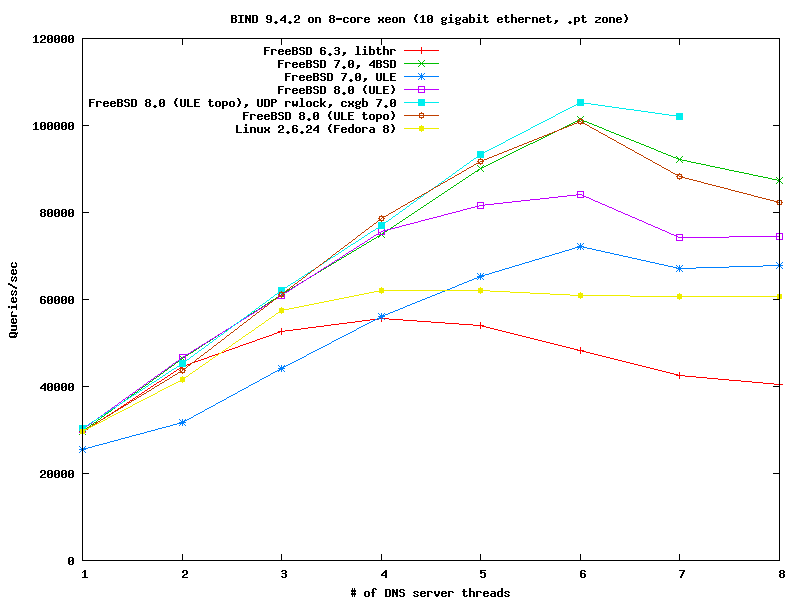 * The drop above 6 threads is due to limitations within BIND. involving high interrupt rates). It is fixed in 8.0. > involving high interrupt rates). It is fixed in 8.0. Kris can you say anything more about interrupt workload bugs on ULE? interrupts. In this scenario am I better of using 4BSD? >> involving high interrupt rates). It is fixed in 8.0. > Kris can you say anything more about interrupt workload bugs on ULE? > interrupts. In this scenario am I better of using 4BSD? throughput. It probably won't matter on UP though. will this patch also be available for 7.0? >> workloads involving high interrupt rates). It is fixed in 8.0. > will this patch also be available for 7.0? > FreeBSD with the same ISC workload. run it well. I've seen this nonsense before and it's tiresome. same version of BIND that I was already running on my server. > configuration but have not yet found the cause. It's called "Anti-FreeBSD bias". You won't find anything. >> FreeBSD with the same ISC workload. > run it well. I've seen this nonsense before and it's tiresome. > same version of BIND that I was already running on my server. >> configuration but have not yet found the cause. > It's called "Anti-FreeBSD bias". You won't find anything. in above results was also analyzed. > on the "rm" list. Mercedes to his wife which she deserves so much ;-) . anit-FreeBSD slams going on; mostly uninformed comments. discussed and there's still lots of room for improvement. made to eliminate known bottlenecks in the application. Its not actually -that- bad an idea to compare different applications. application, network} can be pushed. can identify what they're doing wrong. to see exactly what they're doing differently. > >> FreeBSD with the same ISC workload. > > run it well. I've seen this nonsense before and it's tiresome. > > same version of BIND that I was already running on my server. > >> configuration but have not yet found the cause. > > It's called "Anti-FreeBSD bias". You won't find anything. > > on the "rm" list. > anit-FreeBSD slams going on; mostly uninformed comments. > discussed and there's still lots of room for improvement. > made to eliminate known bottlenecks in the application. > Its not actually -that- bad an idea to compare different applications. > application, network} can be pushed. > can identify what they're doing wrong. > to see exactly what they're doing differently. cannot be made by modifying the kernel. not stress the kernel, but NSD does. > working with us to understand what's going on. when the Lucent-made chipped cards worked fine. really knew what they were doing. amount of ram in the server, and running it up against Linux. they did their testing and informed FreeBSD after the fact. l script not native freebsd-update(). All goes fine till second reboot. libcrypt, libcrypto are missing, or version is changed etc. depencies/libs is missing and go on problems. > community with 7.0 come-out. reinstall all of your ports/packages. > l script not native freebsd-update(). > All goes fine till second reboot. > libcrypt, libcrypto are missing, or version is changed etc. > depencies/libs is missing and go on problems. now i will try fix pkgdb and reinstall all necessary ports. > now i will try fix pkgdb and reinstall all necessary ports. summary to verify that it completed correctly. still the old 6.x version. > many ports upgraded. I don't why old version become as current version. Also you can use script(1) to log, so you can analyze the output latter. if things are not in sync. > > >> FreeBSD with the same ISC workload. > > > run it well. I've seen this nonsense before and it's tiresome. > > > same version of BIND that I was already running on my server. > > >> configuration but have not yet found the cause. > > > It's called "Anti-FreeBSD bias". You won't find anything. > > > that anymore. > > > on the "rm" list. > > working with us to understand what's going on. > when the Lucent-made chipped cards worked fine. > > anit-FreeBSD slams going on; mostly uninformed comments. > really knew what they were doing. > amount of ram in the server, and running it up against Linux. > they did their testing and informed FreeBSD after the fact. > after publishing. Not nice. fine under heavy load. One will cost $4, one will cost $100. or re(4), regardless of OS.